Designed specifically for the Swarovski BTX, the case is made from waterproof Neoprene, fitting tightly around the scope and eyepiece to provide maximum protection at all times. The zoom-and focus wheel can still be easily manipulated through 360° via a lift up flap on the case, something no other case accommodates. 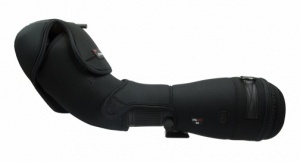 The result is comfortable and fast handling of the Swarovski BTX in all conditions. Price includes the cases for the BTX eyepiece module and the appropriate objective module. Skua cases are designed to provide maximum protection for scopes while in the field as well as protection during transportation and storage and are manufactured to a high quality by Kite Optics.